The halls of Cesar Chavez School were not filled with the typical noises coming from the 400+ student body. Today was a teacher work day. All students had the day off! When I was younger, this meant sleeping in until 11am and waking up just in time for The Price is Right. I arrived at the school at 7:45am and four of our Bike Club kids were waiting at the front with our Program Manager, Kelly Hansen. My lack of caffeine prompted me to ask the kids if they were tired. They looked at me as if I had lost my mind. “No! We are ready to ride!” cried Miguel. I remembered being a teacher and having a 7:30am class and never were children this pumped up for history in the morning. The day consisted of new achievements and opportunities to practice learned skills. We all made it through our first stop light! I witnessed kids overcoming fears together. We giggled at nothing (one of my favorite things) and reminded each other of safe practices. We were strong. We were independent. 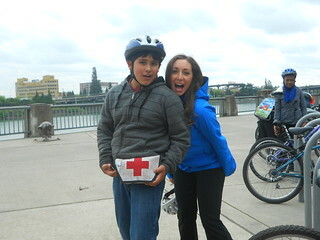 We were the Cesar Chavez Bike Club! 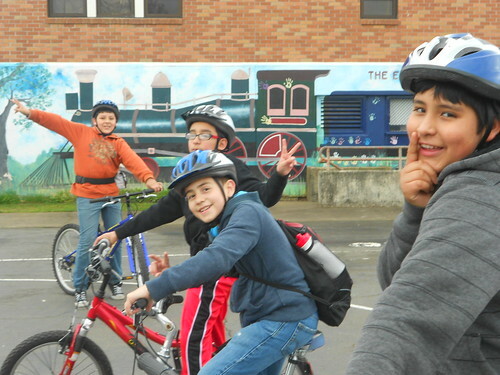 Our Middle School Program is so much more than riding bikes. It supports youth in building confidence, collaboration, and provides opportunities to see other parts of our beautiful city. We ate lunch at Arbor Lodge Park and our instructor, Will, led a conversation on the challenges that the youth see in their community. Kids opened up and addressed issues of violence, cigarette smoking, bullying, and litter. I was inspired to be part of a program that supported youth by engaging in powerful conversations. We then hopped the MAX to the Rose Garden. It is hard not to notice nine Middle Schoolers with their bikes on the MAX. I could feel a sense of pride exuding from their faces. People wanted to know who we were and where we were going. We were self-determined; we were on our bikes. 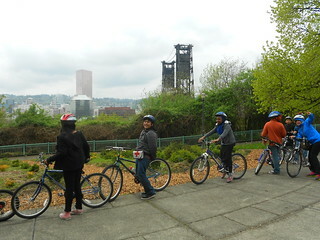 We crossed the Steel Bridge and finally made it to the Waterfront Park. The sun was there to welcome our arrival. Kids were busy taking selfies with their helmets on, breathing the fresh air, and waving at joggers that passed by. Ricky and Miguel were uncontrollably laughing off to the side. This was the kind of laughter that as an adult you remember and want to recapture. I have no idea what they were giggling about and I wouldn’t understand anyway. Will led our group to the water’s edge. As we leaned over, we discovered a large amount of trash in the river. A few youth started to take pictures of the trash and then began conversations about how to clean it up. Bike Club kids are the kids that make you proud! Bike Club kids are problem solvers! Bike Club Kids never give up! We clocked a total of 15 miles that day. Upon our arrival back to Cesar Chavez, I asked the kids how they were feeling. “Exhausted!” they proclaimed. You’re welcome, parents! I now know why Bike Club is so much more exciting than The Price is Right! And let’s be honest, Bob Barker is pretty hard to beat. A special shout out to our Chavez members: Alex, Fatuma, Elian, Jorge, Miguel H., Miguel O., Ashley, Will, Kelly, and Ricky! Thanks for the ride! And does anyone know what Ricky and Miguel couldn’t stop laughing about? We thank these sponsors for their incredible support of the 2014 Bike Clubs.